Thinking of you this Good Friday Anne. have just been enjoying Harvey's 'March-April' chapter, and I can well imagine the sense of absence of deep companionship. I hope the coming few days are v special and I love the idea you have to rekindle the tulip tradition! One thing I've learned about long holiday weekends is to have at least one social thing planned in advance, otherwise it's easy to feel stranded. Single friends are a great asset at such times. It's certainly a whole different way of being, leading the single life. It's another rhythm altogether from being with someone, but in the end it comes naturally and the danger spots become known. Like 'black spots' on the road, one learns to navigate around them. Treating oneself (as you did) is another good trick. Planting bulbs is like planting hope. 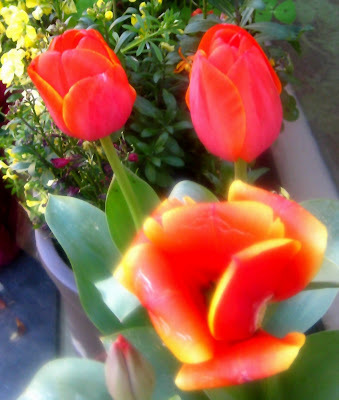 I have my tulips 'wintering over' in the fridge right now.